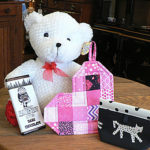 Open Saturdays from 10:00am – 2:00pm, or by appointment. To arrange a visit, please call Janet Barstow – 509-878-1742. Experienced former printers will often be your tour guide, offering an in-depth personal look at the way that newspapers used to be produced. 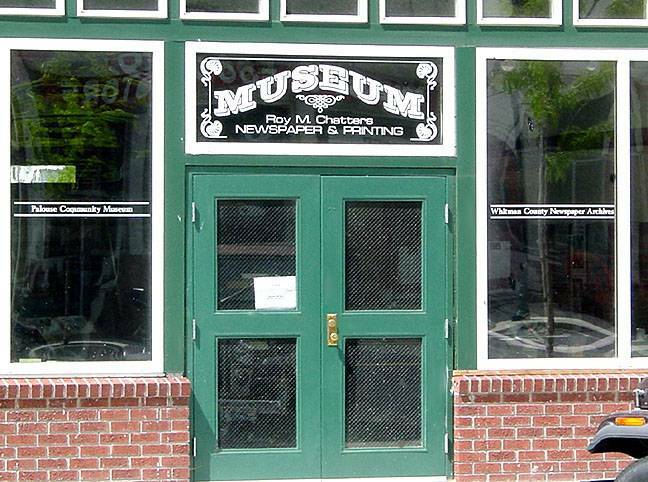 The Roy M. Chatters Newspaper and Printing Museum was originally dedicated to J.B. and Olga West on Palouse Day 1976. The Wests donated the building to the City of Palouse for use as a museum. 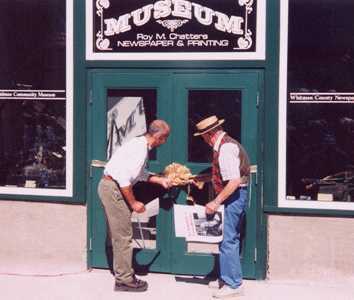 Mayor Michael Echanove and Bob West cut the ribbon to officially re-open the Museum to the public on Palouse Day 2003. A local history section has been added to serve as a tribute to the community of Palouse for its support of the Museum renovation. The Museum features a flat-bed printing press, Linotype machines, Chandler job presses and most everything once used to produce a newspaper. Some items date back to 1898. An extensive archive of Whitman County newspapers is also available for research. Many photos and other interesting items from Palouse history are also housed in the museum. The late Roy M. Chatters, Museum founder, demonstrates the 2-1/2 ton flat-bed press. The last edition of the Palouse Republic printed on this machine still remains on the press. Roy M. Chatters was a retired nuclear engineer from WSU. His family had a background in the printing industry, and when he retired he began a quest to collect antique printing equipment with the dream of setting up a working museum. 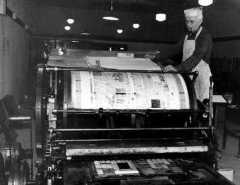 Much of this equipment would simply have ended up in the scrap metal heap as printers began turning to safer, more efficient methods of printing. Dr. Chatters loved tinkering with his machines, and wanted to share them with others. The Museum was open for 20 years, until the flood of 1996 caused extensive damage to the wooden floor and it was closed for safety reasons. We are proud to present it to you once again, new and refurbished, with the same spirit of paying tribute to the printers and newspaper editors who worked so hard to bring the news to their local readers.Group tours are welcome, with advance notice. Experienced former printers will often be your tour guide, giving an in-depth personal look at the way newspapers used to be produced. Volunteers recognized for their exceptional contributions to the Museum project include Trudi McCullough, Annie and Marv Pillers, Ben Barstow, John Sell, Janet Barstow, Bob Olson, Bob West, Paula and Michael Echanove. 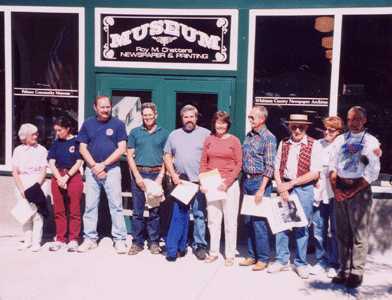 All were presented “Honorary Editor” certificates for their efforts at the museum Grand Re-Opening on Palouse Day 2003. Volunteers worked at the Museum with Dr. Chatters for 20 years, archiving the newspapers and making them research-friendly. A crew of folks saved the Museum during the flood, hauling out boxes and boxes of materials, setting the equipment up on blocks and mucking out the mess afterwards. It was a daunting task. Another crew became involved after the flood, raising awareness of the Museum’s plight, rendering what repairs were possible under the existing budget. In 1999, a grant was received from the Washington State Historical Society, primarily through the efforts of Ed Garretson of the Whitman County Historical Society and Frances Marks, Palouse native and historical society member. The tiled entryway to Jess’ Confectionery, established in 1915 and later becoming The Oasis, was saved from demolition and moved to the Museum for permanent placement. Volunteers have been the mainstay of this Museum from its inception. Then the renovation crew took over. 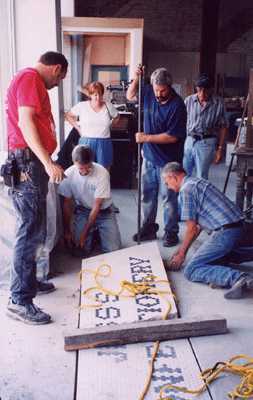 Work began in earnest in January 2000. In three years, the rotted wooden floors were removed and replaced by concrete with radiant heat. Lathe and plaster was removed from the walls and ceiling and replaced with drywall. Partitions were removed. The front wall was stabilized and windows replaced. Electrical work updated the system to meet code. Brick repair was made. Paint gave it new life.